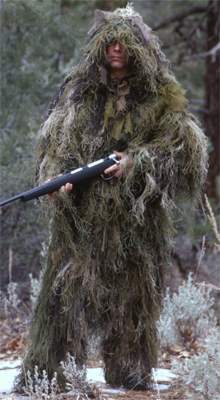 This Ultra Light Ghillie Suit comes ready to use right out of the box and comprises a jacket with a heavy duty zipper, cord locks and elasticated cuff sleeves. The pants feature elastic cuffed ankles, drawstring waist and cord locks Available in two sizing options and in Arid colouring to suit desert or hot weather working areas. The Suit is made of a synthetic string material attached to 3/4 inch netting. It is non allergenic, hand washable, fire retardant and scent-less. Natural vegetation can be added to it as required and it packs down to a cmpact size and can be carried easily in a small pack and put on whenever necessary.